They are systems for attending middle or high populations and they are designed (at least in theory) to can be installed on the nearby of the own population, because of the adverse environmental factors that they allow. In general, the space use obtained is better than in the windrows case and similar to the case of plateaus, but with higher possibilities of work and process operations control than those obtained in the open systems. Really, this is one variant of traditional windrows, where the material is situated between longitudinal little walls. The canals, streets or trenchers are between 3 and 5 m width, the little walls between 2 and 3 m height and the desired longitude (it abnormally varies between 60 and 140 m), the number of streets can also vary (being normally not more than sixteen). Perhaps the most new and outstanding characteristic of this system is the turning method (it is a dynamic system), thanks to a turner that runs over rails situated along the upper part of the little walls and that it could be moved from one street to another by transfers situated at their beginning and ending. The turner attacks the material by a rotator drum provided with a deflector system that introduce the material over a conveyor belt that move it several metres backwards of itself, so all the material of one street has been displaced those metres each time that the turner makes a complete trip, arriving to the end of the street after some concrete number of them. Other technologies of turner’s machines have not belts and it is the own inertia movement of the milling machine or roller which throws and displaces the material. It is referred to another kind of organic wastes treatment in static windrow being in this case, mid-closes or partially confined, where there are several commercial brands. This method started in 1990 and since then it can find more than 170 plants with this method in 27 countries over the world. It consists in a ventilated static windrow covered by a canvas of a semipermeable material, in function of the oxygen demand, by overpressure due to some tubes buried in the soil. The structure of the membrane pores is permeable to water vapour, but not to liquid water, so the material can liberate moisture to the exterior but it does not suffer the meteorological conditions of the zone. About gases flow, in general it is permeable to the principal components of the air, but it has some capacity of NH3 retention, due to the pore size and to the condensate water film in the interior surface of the membrane, where the soluble gaseous substances are retained. In this way, other of its advantages is the reduction of the environmental odorous affections. The system also has a temperature monitoring system although the control of the fan functioning, only it is been in function to the oxygen necessities, which provokes that the mass temperature arises values over 80ºC, maintaining them during long periods of time. Those temperatures limit and inhibit to a large extent the microbial community and produce a high reduction in the number of species that can maintain a degradative activity. 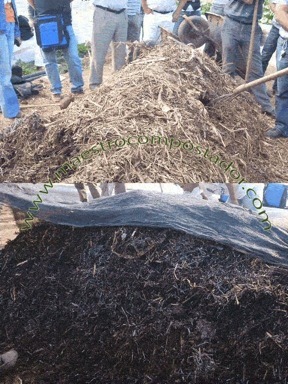 Because of, and although in the beginning could be fit in the given composting definition, it could be an analysis and discussion object if what it is happening in this system is really the composting biological process and not a series of thermo chemical processes that also obtain, stabilize and hygienize the organic matter. In the case that the method would be improved and it would be possible make a control of the process by temperature, we would be in front of a mid-closed composting system, very flexible and of easy application, and close to the closed systems as for parameters and process control. Meanwhile covering the material with this kind of canvas allows us almost guarantee that independently from how bad the composting be made, we are not going to have environmental affections... whilst the canvas do not retire. It is a system which work protocol must be adaptive to the wastes circumstances and to the place where the plant is situated if we want obtain compost. It is a difficult classification method, because it is realized in turned windrows, but it normally uses a semipermeable canvas to maintain the windrow conditions. It is a method developed and property of the family Lübke whom is the responsible of the information transmission and knowledge about the system so its implementation and diffusion have been limited. The best of this method is that is affected by the knowledge of the method, the waste and its necessities, that are which occupy the first place over the technology. Although it is a method more directed to home composting or self composting, it is interesting to show it after the previous methods explained before for its simplicity and the few taken care and control that it needs. It has been developed by the professor Tomás Alcoverro Pedrola from the Agrarian Research Canaries Institute, master composter. 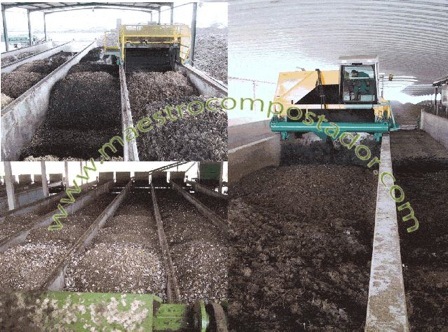 The method consists in building windrows or piles of organic material to compost homogeneously mixed with an enough proportion of structural material, being careful for obtaining a final mixture with the precise moisture. After that, it is covered with a simple opposite lawn canvas and four weeks are left, passed which one gives it the first turn and it is dipped, covering it again. After the next four weeks, the operation is repeated. The windrow must be situated on a shady zone and protected from wind.